Join Teddy Tastic at their Teddy Bears Picnic at Coffee & Crayons this half term. Children can make their own bear, enjoy party games and lunch is provided at this lovely child friendly venue too. Crafty Chefs and Fairytales Come True are hosting a Frozen Tea Party. Queen Elsa will entertain the children with fun and games. Crafty Chefs will help the children make Sven the reindeer biscuits and decorate frozen heart cupcakes to enjoy with their Afternoon Tea. Lion King Lovers will love doing Arts & Crafts, Canvas Painting, Drama Games, Script-Work, Choreographed Dances, Mask-Making, Goodie Bags and more! Children can weave their own mini tapestry to take home, using a variety of materials and colours to express their own person. Little ones can dress up and celebrate at the amazing Greek Carnival. Children will enjoy fun performances by Asterakia, Neverland Events and Greek dancing by The Elites. Children can explore the Greek Carnival traditions, learn how to dance, play traditional games and try Greek food. In addition to this Cheeky Monkeys, SPArties, Crafty Chefs, Glitter face by Aysun, Inside Out Events Ltd, Candy Floss and Popcorn by HoneyPop, Diavazw Greek Books, Osborne Books with Sophie, Eliana Décor Event Planning and Lizzy and Kirry Christening Outfits will also have stalls at this event. Little ones can enjoy enchanting stories, rhymes and fun craft activities for younger children. It is the perfect way to entertain your little ones and make new friends! Children can enjoy a fun packed day of soft play and tie dye! T-shirt’s, dye, expertise and soft play will all be provided. Kids can enjoy a fun packed slime making workshop plus unlimited soft play at KB02. 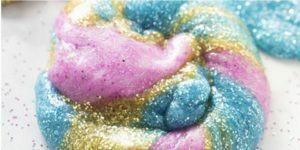 Each child will make their own slime to take home, and will enjoy finding out the perfect formula to make gooey and fluffy slime plus pick their colour and consistency! Tales from the Shed will have vibrant, interactive theatre shows that are perfect for young children over half term. They are informal, lively and amazingly engaging as the performers and audience share the same space – children are always encouraged to make a lot of noise and to make the story happen. Every show will be fun, really silly and that there will be plenty of colourful puppets and live songs. The curious little owl is back, and this time she’s ready to discover the wonders of night-time, from the big, bright moon to the bats in the sky and the foxes deep in the forest. Young audiences will adore this stunning show. Football fans will enjoy fun filled and active days with Sophia’s Diary Award winning Football Schools. Children will learn football tricks, play games as well as have an amazing time and make friends too. When? 18th Feb, 2019 till 22nd Feb, 2019. Special Offer: 37.5% off for Sophia’s Diary Members. Email Pro Elite Football Academy and mention Sophia’s Diary to receive a code! Powerleague’s renowned kids camps will be running during February Half Term. They are great for dropping the kids off when the schools are out offering early drop off and late pick up available on request. Join in the fun and get booked in.